Teaching in Moray - why it's so great. A short 5minute film featuring Moray and some of the teachers that have moved their careers here from the Central Belt. The first teacher to take advantage of an offer of free accommodation by a leading Moray house builder is preparing to move in for the start of the new school session. 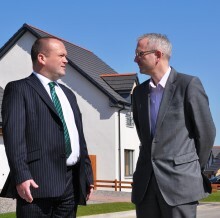 Moray Council and leading housebuilder Springfield Homes have joined forces to attract new teachers to one of the most beautiful parts of Scotland. Work on Elgin High School given the green light. EU wrangle resolved means new school go-ahead.